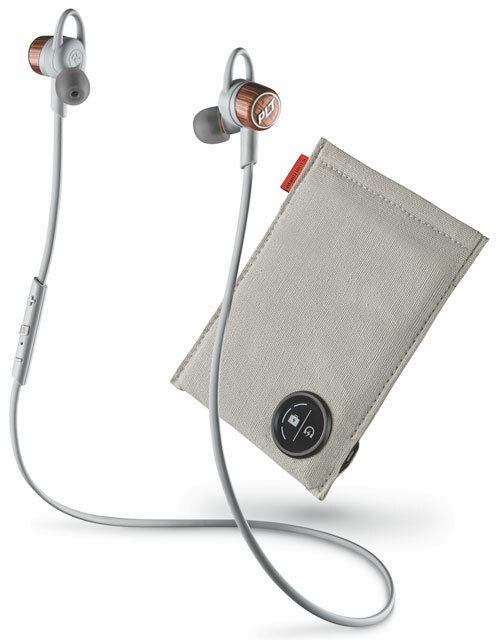 We really liked the Plantronics BackBeat GO 2 stereo Bluetooth earphones, except for one major thing – it got lousy battery life, and one minor thing – they stuck out from your ear perpendicularly, which meant if you rolled over on a pillow while wearing them, you could impale yourself. Both these drawbacks and more are addressed with varying levels of success with Plantronics' completely redesigned BackBeat GO 3, which will go on sale "soon" – sometime this month – for $99.99 solo and $129.99 with a carry/battery bag. Instead of a mere upgrade, Plantronics started from scratch, aiming at making the BackBeat Go 3 the best-sounding Bluetooth phones extent. Some of the improvements are sitting the 6mm driver further down on the tip so it's deeper in your canal and closer to your ear rum, a larger diaphragm to expand the actual speaker surface by 15 percent compared to the GO 2, and redesigning the ear tips to provide a tighter fit and seal. We just started playing with our review sample, so we'll have to let you know if the BackBeat GO 3 match the sonic subtleties of the Optoma NuForce BE6 or the musical muscle of the Kicker EB300, our favorite Bluetooth earphones. While we haven't had a chance to double-check Plantronics' aural enhancement assertions, we could check the GO 3's ergonomics. Their fit is definitely firmer than their predecessor's and keep the GO 2's helpful stabilizer wing, but they do still stick out a bit more severely than we expected, albeit not as drastically as the GO 2. Also continued in the new model is the P2i sweat- and waterproofing. Battery-wise, their music listening life is lengthened from 4.5 hours to at least 6.5. While a significant improvement over the GO 2s – and we'll let you know what our own battery longevity tests reveal – they still fall short of all the 10-hour-plus provided by the collar-based Bluetooth phones from LG. Plantronics' redesign adds a little weight – the GO 3's weigh 19 grams vs. the GO 2's 14 grams. We'll let you know whether or not these extra 5 grams make a difference after a few hours of wear. As with the previous GOs, there's no aptX Android aural enhancement, but you still get voice status prompts. Plantronics has thankfully enlarged both the carry bag, so you don't have to struggle to stuff the GO 3s into it as you did the GO 2s into its tiny red bag, and the built-in battery inside. You'll be able to fully recharge the GO 3's power cells twice with the bag, giving you a total away-from-home listening time of nearly 20 hours, with just 2.5 hours of recharge time. Like the GO 2's bag, you can recharge the phones and the bag battery simultaneously. Unlike the small bag with the previous GOs, the new GO 3 bag has a welcome charging level status LED and indicator icons. You also get 14 hours of standby time, four hours longer than the GO 2s, and Plantronics' six-month deep sleep mode. Unlike the plain black or white GO 2s, the GO 3 come in three colors: gray with copper accents, cobalt black and, a Best Buy exclusive granite black.